Welcome the first One Minute Monday of 2016! This week we examine UK productivity in just one very productive minute. Improving the UK’s productivity is something that the Chancellor prioritised in his ‘Fixing the Foundations’ plan for the economy. 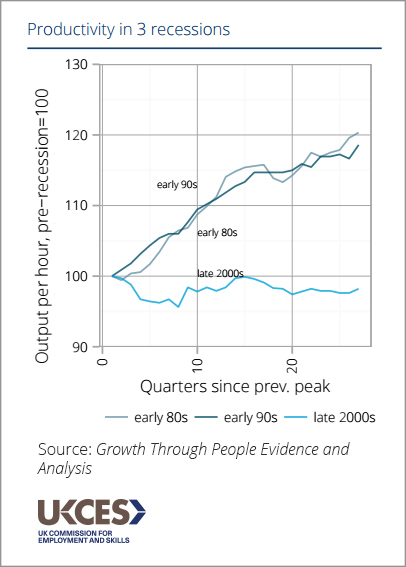 Productivity growth in the UK has been slow since the recession - but isn’t that to be expected? Actually, this pattern hasn't occurred in every recession. In fact, after the recessions of the early 1980s and 1990s productivity quickly surpassed pre-recession levels. So what explains stagnating productivity this time? It's not clear, and a number of factors play a role. The range of theories has led to this being known as the "productivity puzzle" - the Office for National Statistics described it as a "conundrum". Some contributing factors are likely to include underinvestment in skills development, reduced employer innovation, a higher employment rate than in previous recessions, and underutilisation of employees' abilities. If you want to know more about productivity and what’s behind the UK’s slow productivity growth why not catch up on our expert Productivity Masterclasses? To learn more about the UKCES analysis of the UK labour market and economy, see our paper Growth Through People: Evidence and Analysis. Which sectors will provide tomorrow's apprenticeships?